I told you a couple weeks ago that this year I’m really trying to embrace creative challenges that come my way, and one of the projects I said yes to was Iron Craft. 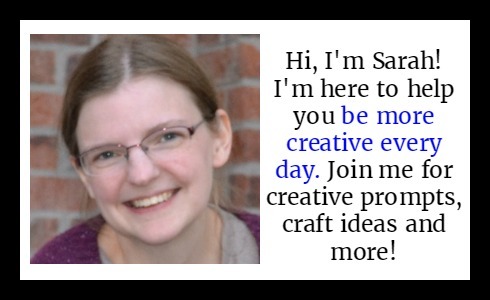 This is a challenge put on by Kat at Just Crafty Enough, which I learned about because she’s a knitter and she often sends me stuff to write about on my Craft Gossip site. 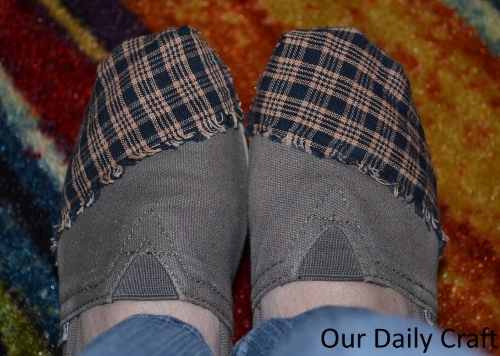 Anyway, the first challenge of the year was to craft something using cotton, and I knew pretty quickly that I wanted to do something about the holes in my Toms. I got these shoes when I was in denial about how much my feet grew while I was pregnant, so they lasted less than a season before I had toe holes in both of them. I’ve been meaning to update them for a while, but I had this idea that I wanted to do some kind of fabric weaving on them, and I wasn’t quite sure how to do that. It came to me that I could use bias tape to make the weaving, because then I wouldn’t have to worry about raw edges. 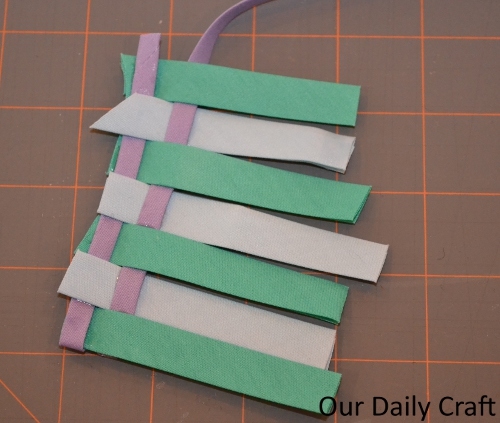 I like the idea of weaving with bias tape, but the colors were wrong for this project. I started working on it, but I didn’t really like the results for this project. I still think it’s cute, but these are not really the colors I wanted for my shoes, and I’m not buying craft supplies right now, so I abandoned the weaving idea for just plain covering with fabric. My no-longer-holey shoes on my feet. I’m pretty sure this woven fabric is cotton. It certainly looks and acts like it. There was a piece of this out in my bedroom for no good reason, and it struck me that this was a nicer color choice for a shoe and still gave me a bit of a woven look without weaving. I really like them, and the good news is, it’s crazy quick and easy to do, too. Let me show you. I started by putting some fabric glue in/over the hole in the shoe and gluing down the remnants of the original shoe as best I could. I thought this might give the fix more stability, but you can skip that if you want or have a giant hole that can’t really be repaired this way. Cut fabric so you have a piece that’s somewhat larger than the space you need to cover. I went with the raw edge being exposed, but you don’t have to do that if you don’t like that look. 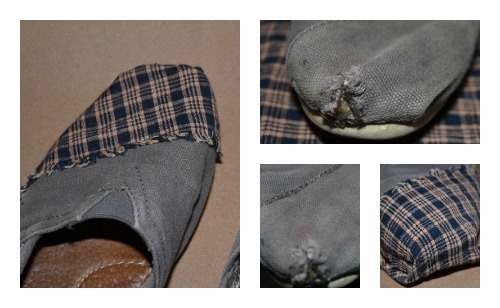 Lay down a bead of fabric glue, beginning across the top of the shoe. Lay the fabric down. Continue along the sides. You’ll have to fold the fabric a bit at the toe, just like on the actual shoe. I glued the fabric to the shoe first, let that dry a bit, then glued the fabric to itself at the folds. Allow to dry and trim the fabric. Repeat on the other shoe. Enjoy your newish shoes until your toes poke through (again!). Check out Kat’s cute sweater pillow case that she made for this challenge, and then take a peek at the Flickr pool for more great ideas for crafting with cotton. There are bracelets, buntings, T-shirts, bags and more! 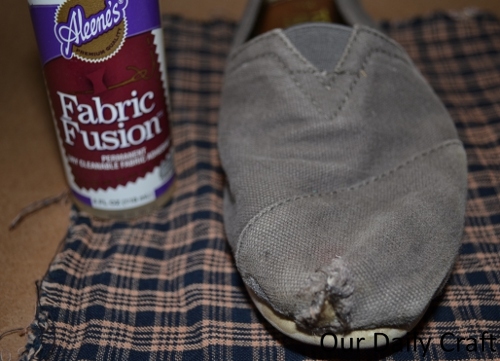 Have you ever revamped a pair of canvas shoes? Or do you have some with holes in the toes like mine? I’d love to hear how you’d fancy them up. Thanks for visiting, commenting and sharing! What a great way to save a pair of shoes from the trash, plus I think they look even better than before! It’s really easy, Jodi! You can do it! Nice one. Creativity has no limits. create post titles tto get people interested. grab people interested about everything’ve written. In my opinion, it could bring your website a littlee livelier.